It’s finally here! A super easy One Pot Fudge Brownie recipe that can be in your oven in less than 20 minutes! When we returned from vacation, I didn’t have enough ingredients to prepare a halfway decent dinner for us, but somehow I had all of the ingredients needed to make these One Pot Fudgy Brownies. That’s how it goes in our house. Priorities, people. 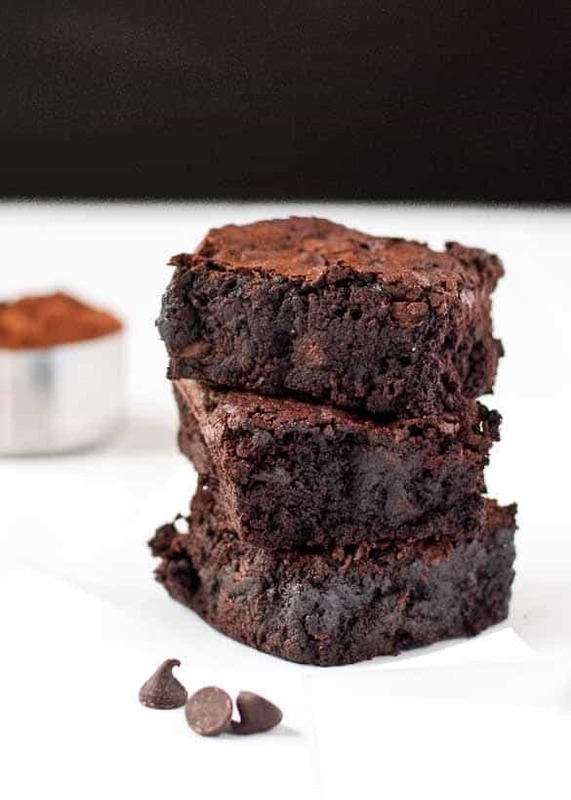 I spotted a recipe for these easy chocolate fudge brownies in Rachael Ray magazine a few months ago, and they were moved straight to the Must Make Immediately List. It’s not that I don’t already have a homemade brownie recipe I love. I do. 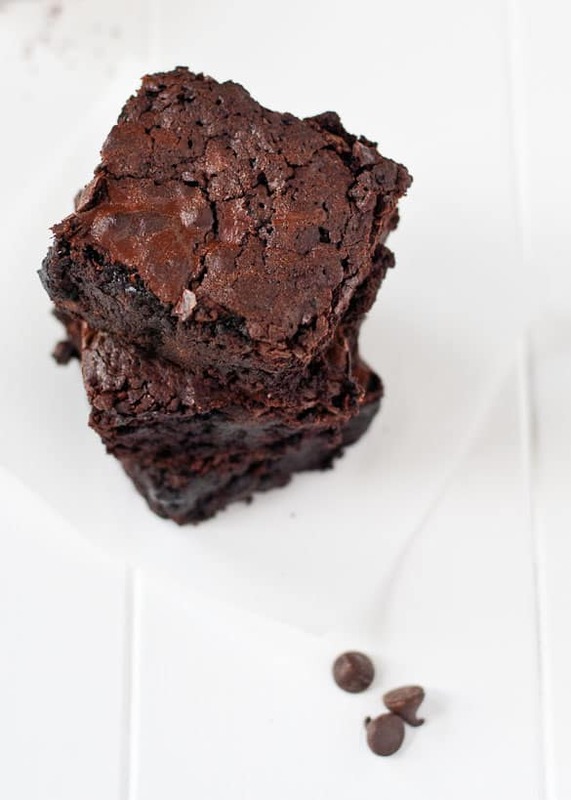 That recipe is rich and fudgy and chewy and all the things I’ve ever wanted in a brownie. The only problem is, it’s not very quick. The recipe isn’t complicated, but it definitely takes longer than the box. So as much as I loved it, I found that more often than not I was still turning back to the good ol’ trusty box mix when a brownie craving hit. But then I found these, and everything changed. I’ve made these at least five times since I found the recipe, and each time I’ve tweaked them a bit more to our liking. Here’s the first thing you need to know about this recipe: It is easy. Ridiculously easy. You can make these almost as quickly as you can make a box mix. 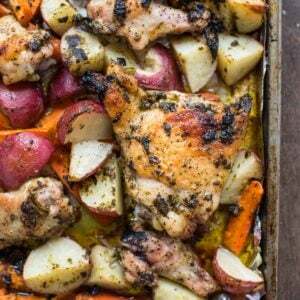 I’m talking in the oven in 20 minutes or less. Maybe quicker once you have the recipe memorized (which I already do…did I mention it’s easy?). The second thing you need to know about this recipe: It is fudgy. This is not a cakey brownie. It’s not an overly sweet brownie. This is a deep, dark chocolate, fudgy brownie. If you don’t care an ounce about why this brownie is fudgy, and you really just want to get them in your face immediately, I understand and completely support you. Scroll down, grab the recipe, and get to baking. But if you’re curious what exactly makes these brownies so amazing, read on friends. It’s about to get all nerdy up in here. Okay, so usually recipes that use all cocoa powder and no melted chocolate tend to yield a drier, cakier brownie, because they lack the cocoa butter found in melted chocolate. So with cocoa recipes, you have to replace the fat with other sources of moisture. For this recipe, that comes by way of melted butter, an extra egg yolk, a higher proportion of brown sugar to white sugar, and the teensiest bit of flour to hold it all together. Science is awesome, y’all. The last thing you need to know about these brownies: They are 100% husband approved. Now, this may seem like a given, but trust me, the Mr. is not easily swayed by the latest and greatest brownie recipe. He’s a firm believer in the box and generally thinks it’s silly to waste time making them from scratch. But even he had to agree these were worth the (minimal) amount of work required for them. They’re devoured at such an alarming rate, I’ve had to purposely space out my baking so we don’t turn into fudgy brownies ourselves. A few more notes on the baking: Err on the side of under baking here. If you use the toothpick trick, you don’t want the toothpick to be totally dry when you insert it into the center of the brownies. It’s perfect if there are a few moist crumbs sticking to the toothpick. It can be tough to tell when these are done since they’re so dark in color already, but if the center is set, take them out. Trust me on this one. Also, add chocolate chips to the batter. There is nothing better than getting a pocket of melted chocolate in the midst of a bite of fudgy brownie. It’s the ultimate in dessert. Well, actually, the ultimate ultimate is serving these chocolate chip studded brownies with a giant scoop of strawberry ice cream. It’s so good, it’s almost wrong. Or maybe it’s actually so, so right. Preheat the oven to 350 degrees. Grease an 8 x 8 inch baking dish. Set aside. In a medium sized pot, melt the butter on the stove top over medium heat. 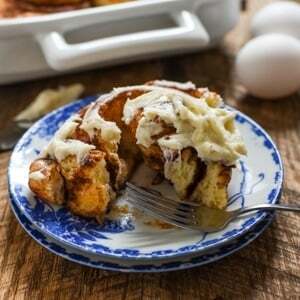 Remove from heat, then whisk in brown and white sugar until smooth and creamy, about 1-2 minutes. Add the eggs and egg yolk, one at a time, whisking well after each addition. Stir in the vanilla. Add the cocoa powder, flour, and baking powder and stir until just combined. Stir in the chocolate chips. Pour the mixture into the prepared pans and bake for 40-45 minutes or until a toothpick inserted in the center comes back with a few moist crumbs attached. Allow to cool or eat directly out of the pan because you have no self control (at least, that's what I do.) Enjoy! There isn’t much better than a warm, fudgy brownie! These look delicious! Yeah science! Also yes to deep, dark fudge brownies. The way they are supposed to be. I never considered myself a science person, until I put it in terms of butter and sugar. Suddenly I love it! Girrrrrrrl, did you write this post just for me? There’s nothing better than freshly baked, dark, gooey, fudgy, melty chocolate studded brownies. And you weren’t kidding when you said this was an easy recipe. I’m swooning from delight over here! I knew you would appreciate these! And I’m so thrilled to finally have an easy from scratch fudgy brownie recipe. It’s been a long search! I highly approve of your pantry priorities. And I am so in awe of how fudgy these are! Definitely a brownie worth trying. Holy brownie goodness!! Those look so downright amazing!!!! Just made these… AMAZING! Wondering… Can you substitute the cocoa for flour to make blondie brownies? I’m so glad you liked them! I’ve never tried changing out the flour for cocoa. I really have no idea what the results would be, but it might be worth a try! These are amazing! I tweaked it just the slightest bit but substituting 1/4 cup of cinnamon baking chips for half the chocolate chips – YUM! Holy cow these are so good!! I have never made brownies like this and love it! I made a double batch and added some chopped walnuts to half. Everyone loved them, thanks!! Hooray! I’m so glad they were a hit! Thanks for coming back to let me know. It makes my day! Ridiculous easy to make! I added a 1/4 cup of walnuts and a bit of nutmeg. SO delicious! So glad you enjoyed them! I’m intrigued by the addition of nutmeg. I might have to try that! Great recipe — very moist and fudgy; not too sweet. I cut down the white sugar by about half and added a heaping teaspoon of espresso powder. Next time, I will cut the sweetness even further by substituting toasted walnuts for the chocolate chips. I think I will have the ultimate adult brownie. I’m so glad you liked it! Crushed dark chocolate sounds wonderful…I bet it made the pockets of melty chocolate even better. Thanks for coming back to let me know how the recipe went for you. It makes my day! THat had me wondering too! Like you, I went with the baking powder. They’re cooling now, so we’ll see. Hi Jane! Sorry about the mix up. The baking powder is right. I’ve fixed the recipe now. I hope you love them! I’m so glad you liked it! Thanks for leaving the tips too! I have these in the oven now! 🙂 I volunteered to take a baked good to my daughter’s choir concert tomorrow. I didn’t have chocolate chips so mine won’t be exactly the same but if the taste of the batter is any indication of how good these will be than they will be delicious! I am using a 9 x 13 pan and set it for 20 minutes. We’ll see how that works. Awesome! I hope they turned out great for you! Glad you liked them Ophelia! And thanks for sharing the tip. These definitely just need a quick stir! Left out chocolate chips and added broken up oreos. They smell delish! That sounds wonderful! Hope you loved them! I just made these for y son’s sleepover. They are cooling now. I left out Tue extra yolk and added my homemade chocolate syrup to make up the difference, I was so excited to find a quick easy and one pot brownie!! I was out of brown sugar, thankfully I had molasses in the house. I hope they turned out great for you Megan! Thanks for coming by to comment! suspicious of the brown sugar making it too sweet, but that didn’t happen. I used Ghiradelli 60% for the chips, which can only make them better. 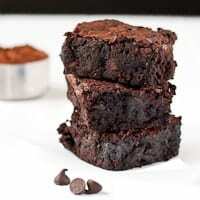 I’m going to pass this recipe/site on to my friend who is contantly on a quest for a better brownie. Thanks, Courtney! Hey Julie! I’m so glad they turned out great for you. I’m sure the darker chips made it extra amazing. And no judgment on enjoying these for breakfast. Second day brownies are the best! I am so glad you love them and shared them with your readers! Your pictures look delectable…and I agree, there can never be too much chocolate! I made these brownies again. The first time, my husband and I both thought they were almost too intense/dense. I know … imagine that. Reason? We could only eat a small one. How fun is that? So, when I made them again (doubled the recipe for a 9×13) and added 1/2 t. baking powder. Perfection. We could eat 2 now. It all comes down to personal preferece, but this will be my go-to brownie recipe now. Thank you, Courtney. Okay. So I didn’t have cocoa powder – the regular kind – but lo and behold! I had Special Dark cocoa powder. Yeah. The kind that dyes your insides black. Mmmmmmmmm! So I used that instead and added a bit more white sugar to cut the bitterness. Oh my goodness. Yeah. Perfect. I am in heaven and will not return anytime soon. This is when I wish there was TastaPost (like Scratch-n-Sniff) so you could sample what I’ve made for yourself. Next time, no halfsies. Full bore, full recipe. Thank you! I am so glad these turned out for you! A scratch n sniff for the computer would be amazing! I can almost taste how rich and fudgy they are just by your description though. This comment made me so happy! I’m so glad you were able to make the conversions and that the recipe worked so well for you. Hideously addictive is my new favorite phrase. Thanks again for coming back here to comment! Okay, so I can’t have chocolate, which is the BANE of my life, however, I tried your recipe but subbed in carob powder and carob chips that I got on Amazon (Chatfield’s brand) and it came out absolutely HEAVENLY!!!!! Ate 1/3 of the pan within 15 minutes so I froze individual portions from the rest of the pan to avoid going into a sugar coma. Next time I will try replacing a little bit of the sugar with Truvia in a vain attempt to try and justify pigging out. Thank you SO much for bringing chocolatey-tasting joy back into my life! It makes me SO happy that this turned out for you and you were able to get a treat that satisfies that chocolate craving! I hope you give it a try and love it! They really are almost as easy as box brownies and SO fudgy! I made them faster by preheating the oven to 400 and baking them for 26 minutes. Just pulled these babies out of the oven, they are amazing!!!! Even though I had to play got potatoe with my piece!!! So worth it!!!! I loved loved loved loved the brownies. These are the best homemade brownies I’ve ever made. Little effort and much more flavorful and moist than others I’ve tried. Thank you!!! That is wonderful! Thanks for coming back to let me know! Do you melt the choclate chips? No. They will get melty in the oven so you’ll just have little pockets of melty chips in the brownies..
these brownies look great! But could I use unsalted butter instead? Absolutely! I would just add a 1/2 tsp. of salt. I have a hard time sticking to recipes but tried this one and it was great. I love fixing it all in one pan. It was very easy to whip up and so delicious that it is sinful. Love it! Thanks so much for coming back to let me know! I’m so glad you enjoyed the brownies! Perfect thick chewy texture and with Special Dark cocoa powder, deep as midnight ? 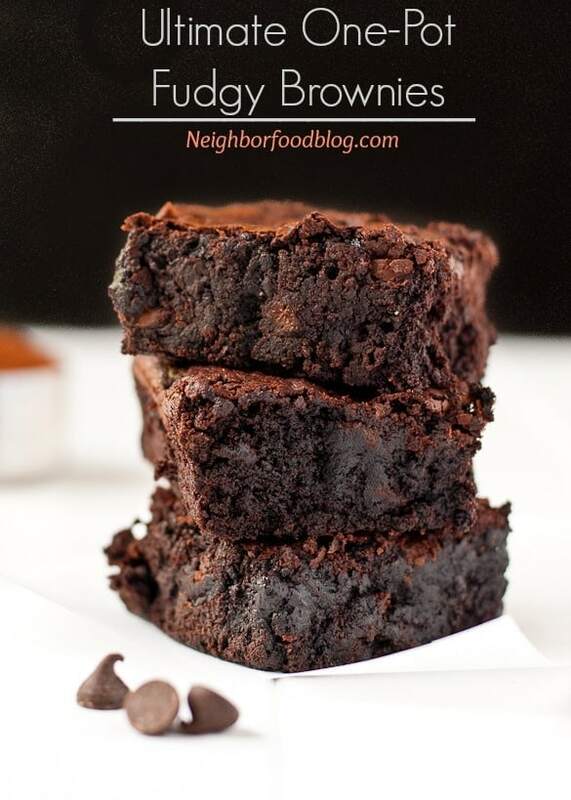 I absolutely love this brownie recipe! I did however add a bit more….. So what I did was I mixed a bit of espresso powder into the mix, and did half semi sweet chocolate chips and half milk chocolate chips. I baked it and let it cool. When it was (ish) cooled, I put on top a whipped mix of cream cheese and Nutella (mmm). I then sprinkled mini dark chocolate chips on top and put it in the fridge until it was set…. omigoodness. I am so glad you like it! That frosting sounds incredible! How many servings do’s it the Brownies make? It depends on how big you cut them. I usually cut them on the smaller side and get 12 pieces. 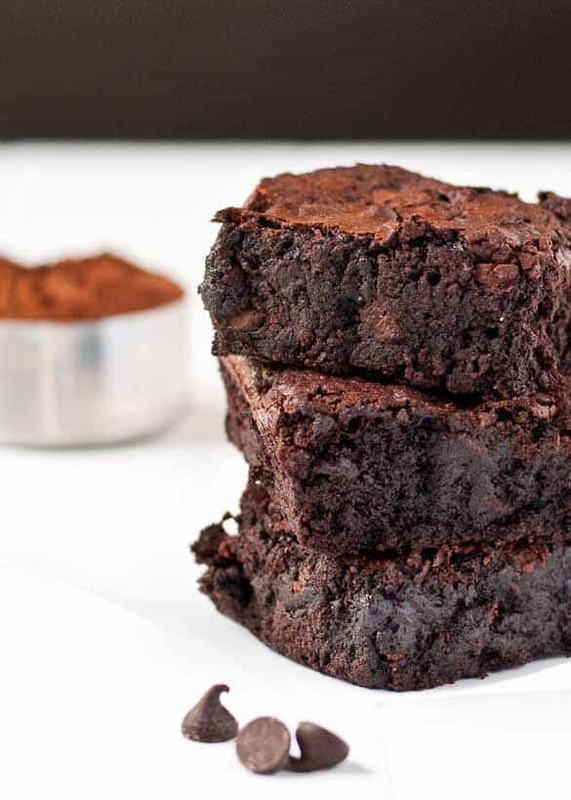 These look delicious but they aren’t what I was looking for when I googled “pot brownies”, didn’t expect a one pot brownie recipe, thanks though! That makes me so, so happy!Thanks for sharing! I use large size eggs. What size eggs are needed? First, I haven’t baked these yet but I can’t wait to, they sound amazing! I had a question about the recipe. In the list of ingredients you list baking powder, but in the recipe directions it says baking soda. Can you please confirm which it should be. Thank you for the catch! It’s baking powder, not soda. I hope you enjoy the recipe!